Can't find your router's web server? The very first step to port forwarding is logging into your router. Usually this is done by opening a web browser and then entering your Default Gateway IP address into the address bar of your web browser. 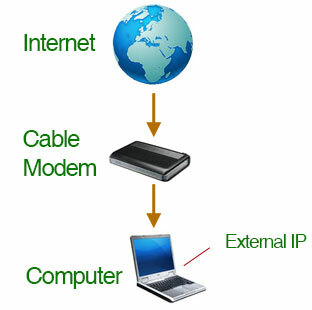 The Default Gateway is to what your computer connects when it sends data to the internet, and the Default Gateway is usually your routers internal IP address. I say usually, because sometimes a DSL/cable modem does not act as a router. There is an important distinction here that is pretty hard to catch. Most DSL/cable modems do routing. If the DSL/cable modem can route traffic, I call it a router. It really is a router, because it provides routing functionality. Not all modems provide routing. Even if you have a router, the routing can be disabled. So, although it is a router, it can be made to act as a simple modem. The whole thing became rather fuzzy when advertisers started calling routers modems. They did this because the average Joe didn't really know what a router was. If you told him you were putting a modem in his house, he immediately knew what you were talking about. Unfortunately there is a HUGE difference between modems, (or a router that is not routing), and routers. A router divides a network logically. 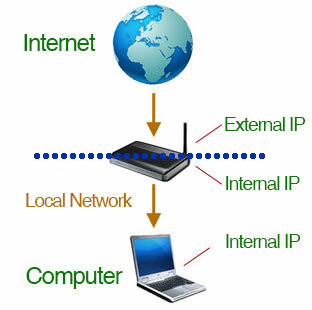 The router takes an external IP address and splits it into several internal IP adddresses. In order to access the internal IP addresses from the internet, you need to forward ports from that external IP address to the servers internal IP address. Most networks are setup this way. If you want to know more about how a routing network works, take a look at our What is Port Forwarding page. A modem (or a router that is NOT routing) just connects two networks. You can think of it as being directly connected to the Internet. You get your IP address from the router at your ISP. So that's all nice, but I bet your wondering what it has to do with you. Well, when you type your Default Gateway's IP address into your web browser, you are trying to connect to some router. If your modem is not acting as a router, then to what router are you connecting? You would be connecting to your ISP's router, and it will probably not have a web interface. Your ISP could be giving you private or public IP addresses. Private IP addresses start with 10., 192.168, or 172.16-172.31. If your IP address starts with one of those then you are behind some router's NAT. The real question is, "Is it your router's NAT or your ISP's?" If it is your ISP's then you need to contact them and get a public IP address to use the software you are trying to use. Most ISPs charge for public IP addresses. If you have a private IP address and you think it is your router's NAT, you could try telneting to your router. To telnet just open up a MSDOS prompt window, and type "telnet (Default Gateway)", where Default Gateway is your Default Gateway IP address. It is really hard to know if you are telneting into your ISPs router or your own. If you are confused it would be best to contact your isp at this point.